NGC 3603 is a bustling region of star birth in the Carina spiral arm of the Milky Way galaxy, about 20,000 light years from Earth. For the first time, this Chandra image resolves the multitude of individual X-ray sources in this star-forming region. 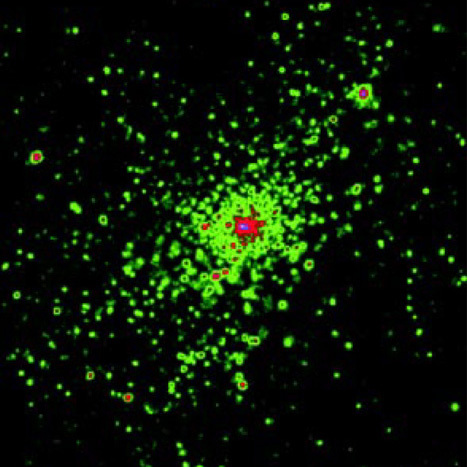 (The intensity of the X-rays observed by Chandra are depicted by the various colors in this image. Green represents lower intensity sources, while purple and red indicate increasing X-ray intensity.) Specifically, the Chandra image reveals dozens of extremely massive stars born in a burst of star formation about two million years ago. This region's activities may be indicative of what is happening in other distant "starburst" galaxies (bright galaxies flush with new stars). In the case of NGC 3603, scientists now believe that these X rays are emitted from massive stars and stellar winds, since the stars are too young to have produced supernovas or have evolved into neutron stars. The Chandra observations of NGC 3603 may provide new clues about X-ray emission in starburst galaxies as well as star formation itself. Scale Image is 8.2 arcmin across. Coordinates (J2000) RA 11h 15m 09.60s | Dec -61° 16' 11.40"